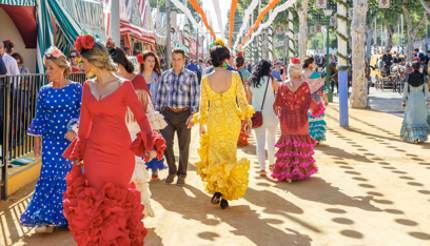 The vivacious Feria de Abril (aka April Festival or Seville Fair) is typically held in April, however, this year it’s taking place from 4 to 11 May, two weeks after the Easter Holy Week. It’s a celebration of everything Seville holds dear. Flamenco? Check. Bullfighting? Check. Horse-drawn carriages? Check. Partying and dancing? Check. Enough churros and chorizo to right all wrongs? Checkmate. Seville is well served by San Pablo Airport which lies 8km (5 miles) northwest of the city. 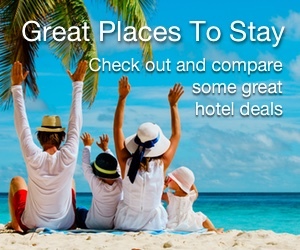 Search for your flights on Skyscanner to find the best and cheapest options available. 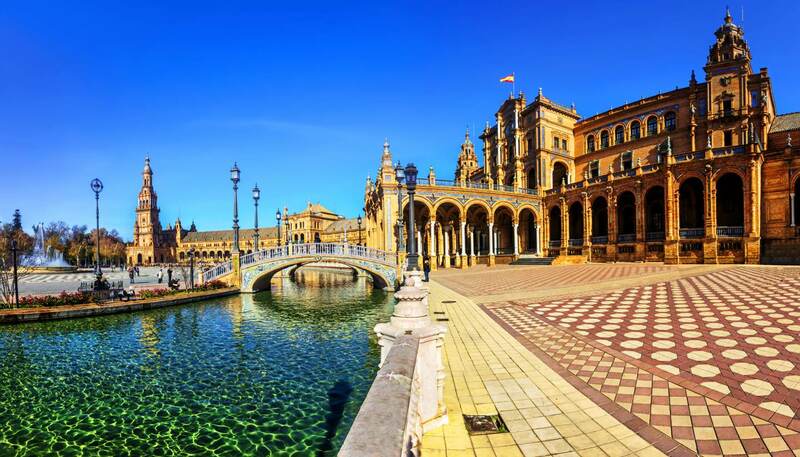 If you’re departing on May 4 and returning on May 11, a quick check on March 13 reveals the cheapest flights from London to Seville start from £136 with Ryanair and take approximately 2 hours and 50 minutes for a direct flight. Once you arrive, bus Línea EA connects the airport with Plaza de Armas in the city centre. The journey takes around 35 minutes and costs €4. Before you go, see the Seville travel guide. Contentiously hijacked by US college campuses and nicknamed ‘Cinco de Drinko’, the annual Cinco de Mayo celebrations in Puebla, Mexico are actually colourful, food-filled festivities that commemorate the Mexican militia victory of 5 May 1862 during the Franco-Mexican war. For the best taste of the action, head to the vibrant colonial streets of Puebla, located about 130km (81 miles) southwest of Mexico City, where they celebrate with a huge parade featuring mariachi bands and plenty of dancing. The battle of Puebla is also re-enacted on the original site. While you’re there, give Chiles en Nogada a try – stuffed chilli in creamy walnut sauce, sprinkled with pomegranate seeds and parsley. This Puebla invention represents the colours of the Mexican flag (green, red and white) and is sure to tantalise the tastebuds. London to Mexico City from £482 with Aeromexico. This direct flight takes 12 hours and 10 minutes. New York to Mexico City from US$322 with Viva. This direct flight takes 5 hours and 30 minutes. Tel Aviv Promenade (Tayelet in Hebrew) runs the length of the city’s shoreline, so scouting for the perfect spot to lay down your beach towel is a serious task. Hilton Beach is a popular surfing site and is also famed for its inclusivity – with dog- and gay-friendly sections. Join the locals for a game of Matkot aka paddleball, a head to head tennis style activity played by two people hitting a small hard ball to each other with specially designed paddles. Beach volleyball is popular in Tel Aviv too, so join in a pick-up game if you want to break a sweat. On May 18, Tel Aviv plays host to the Eurovision Song Contest 2019 so be prepared for expensive flights and accommodation. London to Tel Aviv from £213 with Wizz Air. This direct flight takes 5 hours and 10 minutes. New York to Tel Aviv from US$1,087 with EL AL, Israel’s national carrier. This direct flight takes 10 hours and 30 minutes. 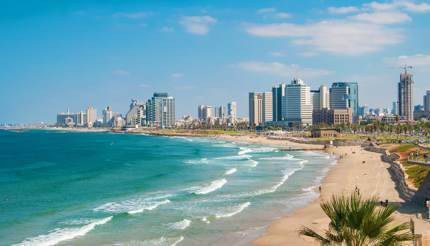 Singapore to Tel Aviv from SG$1,171 with a combination of Scoot and EL AL. This flight has a quick stopover in Bangkok and takes 18 hours. Upon arriving, the best way to get from the airport to Tel Aviv is by train. The journey takes about 15 minutes and you can purchase a ticket at the ticket booth outside Terminal 3. Before you go, see the Tel Aviv travel guide and the Tel Aviv food & drink guide: 10 things to try in Tel Aviv. Oahu is an adventurer’s dream. The island draws athletes from around the archipelago with the Honolulu Triathlon on May 12. 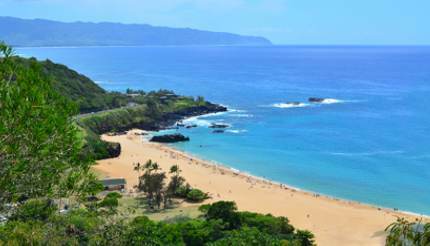 If the 1.5km (0.9 miles) swim in the pellucid Pacific leaves you wanting for further aquatic undertakings, by May the choppy waters of Waimea Bay have calmed enough for amateur surfers and swimmers. Alternatively, hike the perilous peaks of Waianae ridge, tour the island by ATV or helicopter, shark dive, scuba dive, or skydive. The real challenge in Honolulu is finding a square metre of the city that doesn’t pack a thrill. London to Honolulu from £649 with Westjet. This flight takes 21 and a half hours with a stopover in Vancouver. New York to Honolulu from US$551 with Delta. This flight takes 14 hours and includes a stopover in Los Angeles. Singapore to Honolulu from SG$850 with Air China. This flight takes 17 and a half hours and includes a stopover in Beijing. Before you go, please see the Honolulu travel guide and the Honolulu food & drink guide: 10 things to try in Honolulu, Hawaii.